UFC 146 Results | MMA Fighting Events Videos Techniques UFC Fight Picks and News. 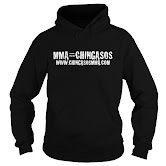 MMA (Mixed Martial Arts) fans were treated to a night of exciting finishes at UFC 146! The fight card moved along so quickly with all the first round fight finishes that several of the undercard fights were able to be showcased on the pay per view. Here are the full UFC 146 results. Mir attempted a takedown early but Santos was able to fight if off. Santos forced Mir into standing and was able to land hard shots. Mir was able to stay in the fight through the first round, but eventually in the second, the hard punches from Santos proved to be too much as he floored him with a hard chingaso and then went in for the finish by dropping more fists on his head that forced Herb Dean to stop the fight. Results: Junior Dos Santos wins via punches (TKO) at 3:04 of the second round. Velasquez wasted no time in getting Silva to the ground and then unleashing some elbows that cut Silva's face. From there it was all Velasquez with ground and pound. 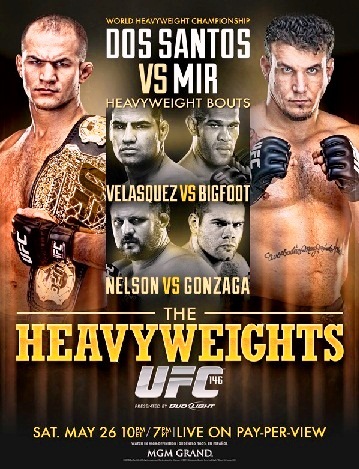 Results: Cain Velasquez wins via punches (TKO) at 3:36 of the first round. Herman comes out with great looking Muay Thai techniques, but Nelson launches and lands a right overhand chingaso that land clean and lays out Herman. Results: Roy Nelson wins via KO (punch) at 0:51 of the first round. Shane Del Rosario dominated round 1 with solid leg kicks. Miocic gets a takedown in the second round and unleashes vicious ground and pound. Results: Stripe Miocic wins via elbows (TKO) at 3:14 of the second round. Johnson pressures Struve up against the fence. Struve pulls guard, wraps up an arm an finishes with the submission technique. Results: Stefan Struve wins via armbar submission at 1:05 of the first round. Brandao started off well, but eventually left openings for Elkins to take the momentum and begin to score. Barboza put in a good effort, but Varner just seemed a little bit better at every aspect of MMA mixing up his attack finally finishing on the ground with hammer fists. Results: Jamie wins via punches (KO) at 3:23 of the first round. Miller had no answer for the solid, blanketing wrestling of C.B. Dollaway. Hardy and Ludwig engage in a striking battle where every chingasos had some steam behind it. Hardy lands the hardest with a lead left hook that floors Ludwig. Hardy then went in for the finish dropping solid elbows. Results: Dan Hardy wins via punches and elbows (KO) at 3:51 of the first round. Results: Paul Sass wins via triangle-armbar submission at 1:54 of the first round. Results: Glover Teixeira wins via arm triangle submission at 1:53 of the first round.